I finally mustered the courage to "reproduce" nasi lemak in my little Austrian kitchen by substituting pandan leaves with pandan paste. The rice cooking process was rather simple by substituting water with coconut milk, adding a dash of pandan paste for that pandan fragrance and a pinch of salt for taste. The rest of the job was basically done by the trustworthy rice cooker. 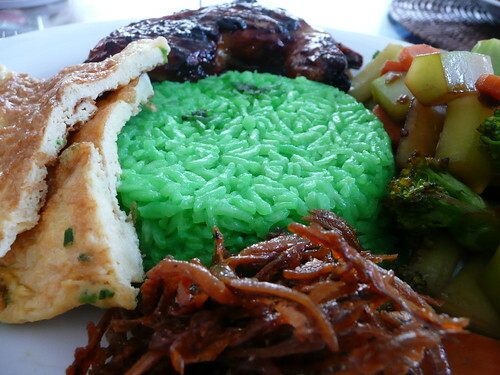 However, in my case, I was a tad too greedy and added in more pandan paste than required, resulting in the darker than necessary green rice. The rice was also a little bit burnt at the bottom of the rice cooker but nevertheless, burnt rice can be rather tasty too. I also left the rice to simmer a while longer in the cooker instead of serving it straight away which kind of made the rice taste better. The rice was accompanied by fried egg slices, yummy chilli ikan billis (made by my mom), grilled chicken drumstick and stir-fried broccoli and carrots. Just some slices of cucumber would have been great accompaniment as well but it can be a challenge to find tasty, crunchy cucumbers in the local supermarket. Furthermore, the broccolis in the refrigerator were fast aging away so where better to store it than the stomach?